Mmmmm! It's time for early morning masses and heavenly jingles once again. Welcome the sunrise with a cup of tsokolate and a serving of Biko with Minatamis na Buko. 1. Wash the glutinous rice, set in a pot and add the water and the rolled pandan leaves. 2. Bring to a boil, then turn the heat down to simmer until the liquid is fully absorbed by the rice. 3. 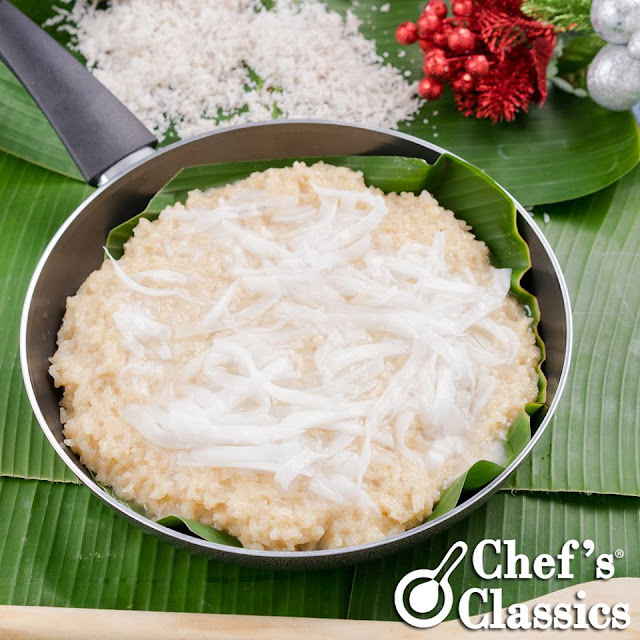 Heat Chef's Classics Melissa Frypan, pour in coconut milk, and add in sugar. 4. Once coconut mixture thickens, add the cooked rice and mix until well incorporated. Remove from the pan, set aside in a plate to cool down. 5. For the "minatamis na buko", just simmer buko shreds, sugar and water in a saucepan, turn off heat once the mixture thickens. 6. To assemble, place the banana leaves at the Chef's Classics Melissa Frypan and brush with oil. Spread the sticky sweet rice on the leaves and flatten evenly. 7. Put the "minatamis na buko" toppings and remove frypan's handle. Bake for 5 to 10 minutes for that very aromatic and flavorful brown top. 8. Best served with Kapeng Barako or tsokolate-ah after Misa de Gallo.